We initiate coverage of GasLog with a BUY recommendation and target price of USD 18. The company has a fleet of 27 LNG Carriers (including five newbuldings) with a contract coverage of 76% in 2017 and an average minimum back-log per contracted vessel of ~5.5 years. Although the secured cash-flow enables the company to pay dividends even at the trough (current annualized dividend yield at 8%), it also equates to less operational leverage at what we believe to be the expansionary point in the cycle from mid-'17. In addition, GasLog is exploring possibilities within the booming FSRU segment, and has an attractive source of financing trough its MLP (at least in the current environment of low interest rates). We find low risk and great valuation in GasLog and initiate coverage with a BUY recommendation and TP of USD 18. We initiate coverage of Seanergy Maritime with a BUY recommendation and target price of USD 1.25. The company has made some very attractive acquisitions at the bottom of the cycle, one example being the two 2010-built Korean Capes which have appreciated ~60% since the deal was announced six months ago. We see recent equity issuances as accretive given the appreciation of asset prices. However, we believe a discount on the company vs peers is just given several factors; including the At-The-Market (ATM) program, recent fee structure, the class A Warrants and share illiquidity. Valuation: Our target price of USD 1.25/sh is based on a NAV of USD 0.94/sh, but added value from the optionality of a further 10% increase in asset values which would equate to a NAV of 1.67/sh, and applying a 25% discount. The implied asset value elasticity of NAV is 79% in our calculations, which is attractive given our view of rising asset prices, but equally sensitive on the downside... We recommend the less risk averse investor to BUY the share. The first quarter of the year definitely surprised on the upside in terms of seasonally high earnings and rising asset prices. The latter is natural when considering that most listed players have a strong currency in its share price after the recent surge, and we have seen several very accretive shares-for-ships type deals. 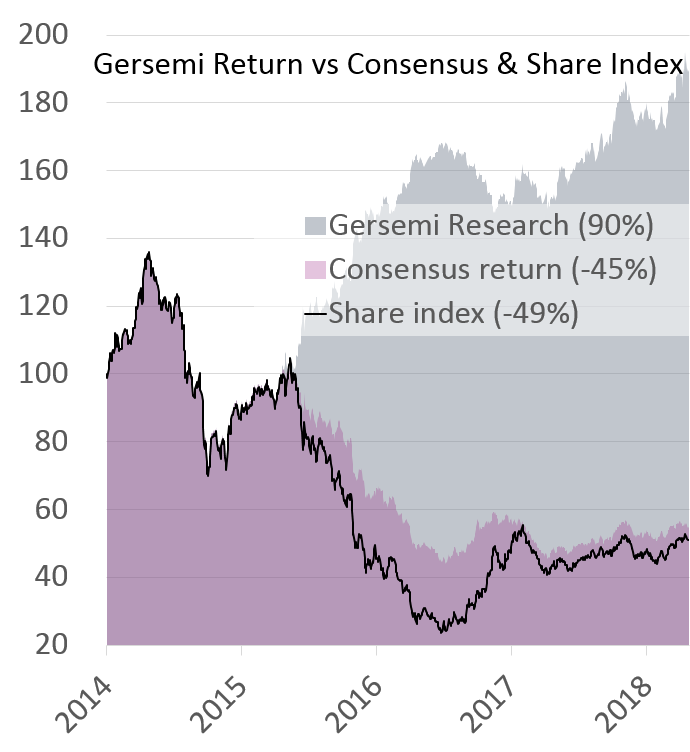 Although we have a positive view on the dry bulk sector, we are lukewarm to the shares as too much of the cyclical upturn is already priced in. Earnings are lagging with a median EV/EBITDA of 28x in 2017E and 17x in 2018E on our estimates. Thus, we find the current valuation too steep, although with a few company-specific deviations. Any potential fall in share prices could represent an excellent opportunity to buy.